We believe the preservation of the cultural and physical history of our area brings an understanding to the past and present, and provides a guide for the future. The Marquette Regional History Center not only maintains exhibits, artifacts and a research library, it is a forum for engaging the community and creating links between people. 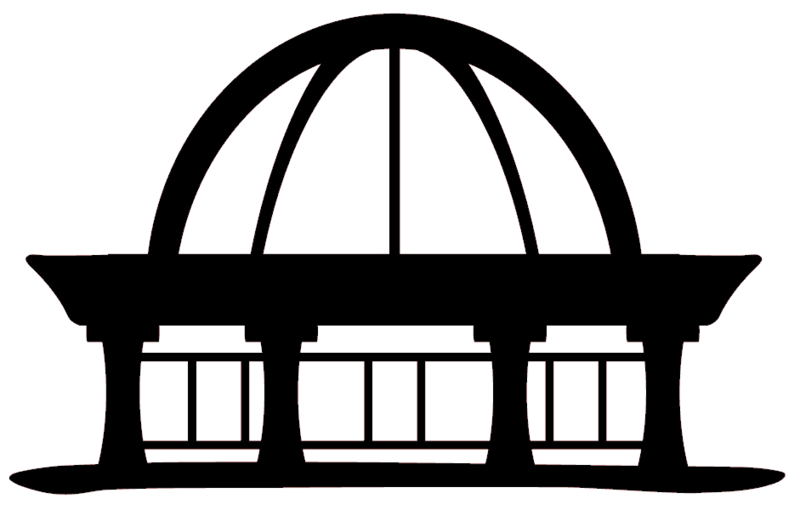 The Marquette Regional History Center is a 501c3, private non-profit organization that was established in 1918. We receive no public funding. We rely on membership, fundraising events, donations, and admission fees to continue to provide our community and visitors with high quality, educational programming and exhibits. We invite you to learn more about the History Center. Plan your visit. Become a member. Read our blog. Make a donation. Over the last two years, with help from a core group of donors, we exceeded our goal of raising $2,500 to acquire better presentation equipment. We purchased two 75-inch screens and can now hold visually engaging presentations year round at the History Center! Ongoing fund: digital technology infrastructure. ​In 2018, the Marquette Regional History Center turned 100. In 2018 the National Museum of Brazil burned down and priceless information was lost. In 2018 the Houghton County Historical Society flooded. Thankfully, most of the collection was saved by fast-acting volunteers. We need your help improving our digital technology to keep our vast collection of historical documents and information safe and accessible. Keeping up with technology is one of the hardest things to do for a non-profit organization. This is an on-going need. Thank you for your help! ​Along with a series of craft workshops throughout the year, this exhibit will showcase a variety of traditional crafts. 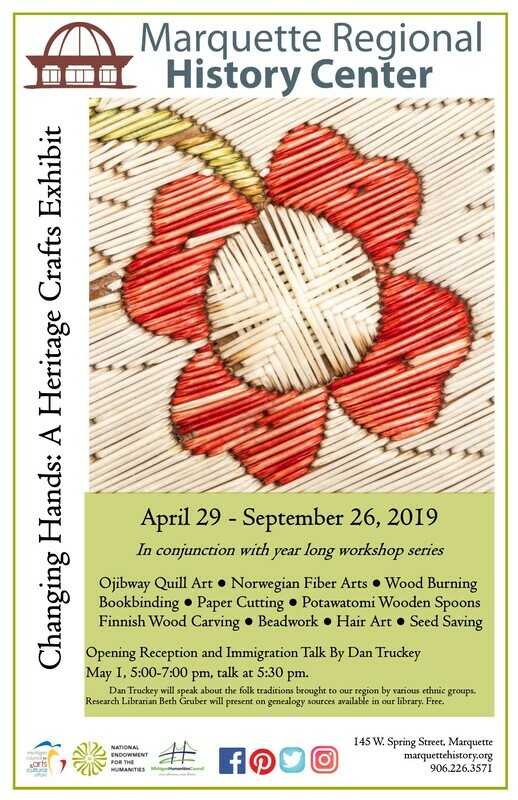 Topics will include: hair art, Norwegian fiber arts, beading, miniatures, wood burning, bookbinding, paper cutting, Potawatomi carved wooden spoons, Finnish bird carving, Ojibway quill art, and seed saving. Learn more about the crafts of our immigrant, Victorian and Native American ancestors. It will include exquisite examples from the History Center's permanent collection, the workshop instructors, and the community. Dan Truckey will speak about the folk traditions brought to our region by various ethnic groups. Research Librarian Beth Gruber will present on genealogy sources available in the Longyear Research Library. Light refreshments will be served. Free, donations appreciated. The Marquette Regional History Center was awarded a $19,500 grant from the Michigan Council for Arts and Cultural Affairs and National Endowment for the Arts. The grant will assist the MRHC to continue the mission to preserve our area's history through compelling exhibits, public programs and classroom field trips. The grant was awarded through the MCACA peer review process and is for MCACA fiscal year 2019 funding. Organizations receiving a MCACA grant award are required to match those funds with other public and private dollars. Local business support of the MRHC include: Swanson, Mercier & Associates, Northern Michigan Bank& Trust, Wealth Strategy Group, Casa Calabria, Mining Journal, TV6, Rotary, Eagle Mine, UPHP, just to name a few. The History Center receives significant volunteer support from the community. We have over 50 volunteers. Without their help we could not provide the things people have come to expect from us. These dedicated people work with our curator, our educator and with school groups and present public programs, they help with all aspects of the research library and at the front desk welcoming guests. Thank you to our business supporters and to every one of our volunteers! The MCACA peer review process allows for each grant application to be competitively considered by a panel of in-state and out-of-state arts and culture professionals. This ensures the residents of Michigan and visitors will have access to the highest quality arts and cultural experiences. Visit Michigan Council for Arts and Cultural Affairs for a complete list of grant awards around the state.